A big thank you to Jerry Mitcham and Barry Dydyk who spearheaded the SMMTC effort. Jerry contributed his wisdom and about 51 hours of time. Barry contributed the same number of hours as Jerry but in addition to his wisdom he provided some wry humor to keep things moving along. To the Parents of these a Scouts - a BIG thank you for raising your young men to be fine citizens and terrific volunteers. 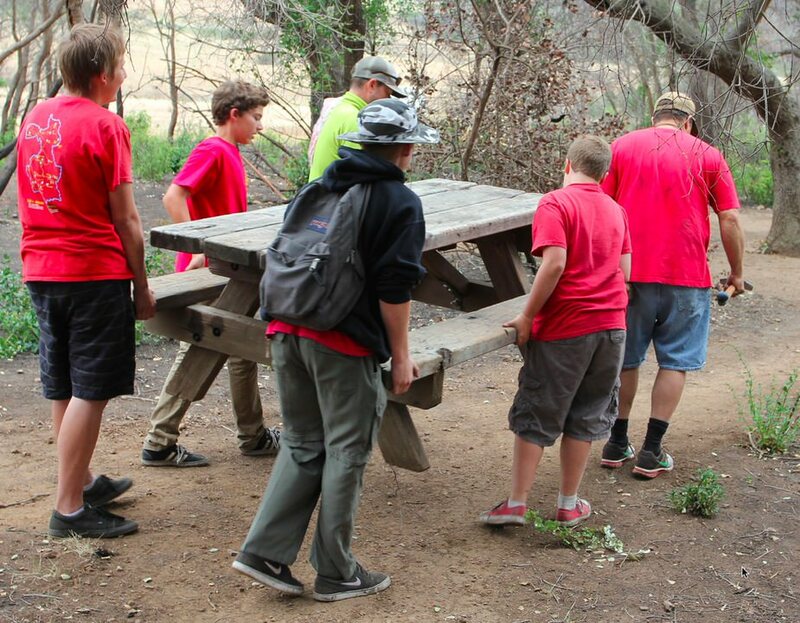 In the Spring of 2014, the Santa Monica Mountains Trails Council and Boy Scout Troop 730 of Newbury Park teamed up to restore the La Jolla Valley “Hike-in” Campground, destroyed in the Springs Fire. 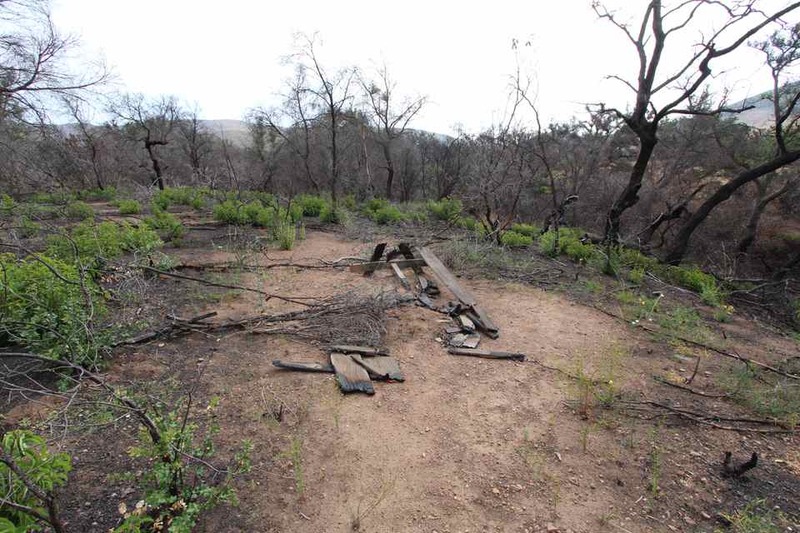 As the Springs Fire swept through Point Mugu State Park in April 2013, the popular La Jolla Valley “Hike-in” Campground was almost completely destroyed. Seven of ten picnic tables, an interpretive kiosk and most signage were destroyed. Fortunately, the recently installed, pit toilet survived without any noticeable damage. While the larger Oak trees seem to have survived, almost all of the smaller trees and brush were consumed. Prior to the restoration, the campground was not a very inviting sight. Trails Council members and State Parks employees surveyed the damage and developed an overall plan to rehabilitate the facility. The plan was submitted to, and approved by local State Park Officials. The Trails Council committed to spend up to $10,000 to purchase equipment and materials for the restoration. Four Eagle Scout candidates from Troop 730 committed to perform the labor for the project with four separate sub projects. The project restored eight individual campsites and two group campsites. Three other campsites, which were located on an archeological site will be abandoned and the sites restored to a natural state. Nine new picnic tables were purchased and installed, while three surviving tables were repaired. New, metal food storage boxes were attached to each of the tables. A new information kiosk and new signage were installed and trails throughout the campground were repaired. Trash and debris left from the fire were removed. The four Eagle Scout candidates worked together to parse the overall project into four sub-projects of approximate equal size. Each Scout was responsible for planning his own project, including recruiting volunteers to assist in the work. The Eagle Scout also organized his team and supervised it to project completion. Each of the sup-projects was accomplished on a different weekend. The first of the four sub projects was completed in late May and the final project completed in mid-July. Prior to completion of the project, numerous campers were observed using the facility. The Santa Monica Mountains Trails Council is a nonprofit 501(c)(3) organization dedicated to establishing and maintain the public trail system in the Santa Monica Mountains National Recreation Area. While the Trails Council frequently donates money for specific projects to the local park agencies, it’s volunteer trail crew contributes several thousand volunteer hours to maintaining the trails ever year. Boy Scout Troop 730 was established in Newbury Park in 1967. Currently, it is sponsored by St. Matthew's United Methodist Church. Since its founding more than 40 years ago, Troop 730 has seen the involvement of more than 1,000 Scouts and Scouters. The Troop has also been the nest for over 90 Eagle Scouts. 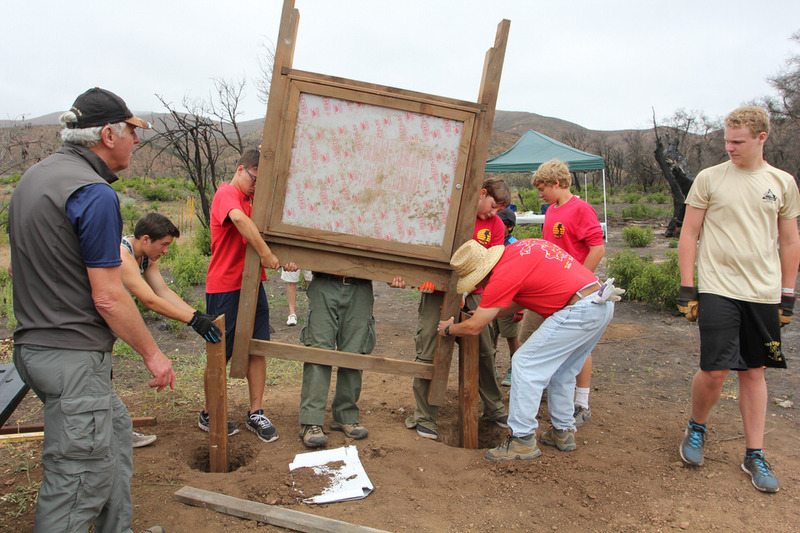 A series of four Eagle Scout projects were organized to restore the La Jolla “hike-in” campground destroyed in the Springs Fire in April 2013. This project restored eight individual sites and two group sites and included some new signage. Dates for these projects were May 23-25, June 6-8, June 13-15 and July 11-13. Adult Volunteers contributed over 365 hours of their time for this project. The labor of the Boy Scouts (who are minors) is not included because of State Park rules but would nearly double the number of reported hours.